Hi! We're back with another Me Moment. Today we'd like to talk to you about Safco's RSVP tables. The tables come in a cherry or grey top with a black or silver base option. Choose casters if your table is on the go. From TV table to side table, this table fills the void of any table that you need. In my office, the RSVP table works great for that 5 minute status update that we all need. Sit or stand with the pneumatic; I give my co-workers that option. Any height is an excellent fit when choosing the RSVP. This has been another Me Moment. Please join us again to find out how Safco can help you work hard and play harder. Great for a wide variety of applications, the versatile RSVP table from Safco is a must-have in virtually any space. Choose between a grey or cherry top and a black or silver base. Wherever you need an easy, or on-the-go table, the RSVP table is the perfect solution! 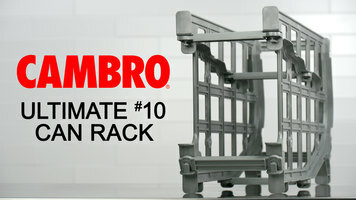 Easily organize and store your canned food with the help of Ultimate can racks from Cambro. Made of heavy duty plastic that will last without wear or rust, this rack is designed to optimize the storage in your kitchen with ease! 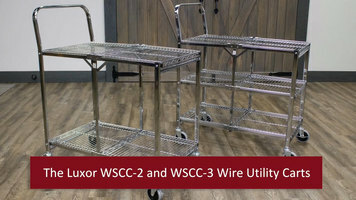 The Luxor wire utility carts are not only durable, but they collapse for easy storage. Take a look at these two and three shelf carts to see all the benefits they can bring to your kitchen. Built with a lightweight, but heavy-duty design, the Lifetime 6 ft. stacking table is perfect for any event, big or small! Thanks to its easy assembly and innovative stacking technology, this table saves up to 20% of storage space and won't slip or slide during transport, making it an easy unit to not only carry and set up, but store. 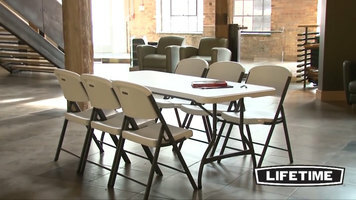 Learn more about what this table can offer and how it simplifies event set-up by checking out this short, introductory video.